A bit of group history – The group was formed in 1964 by a teacher working at the local grammar school and it was initially recognised as a choir. Members, however, expressed a desire to learn more about their local culture and began to learn the traditional folk dances of their region. Besse is a village not far from the town of Kassel. 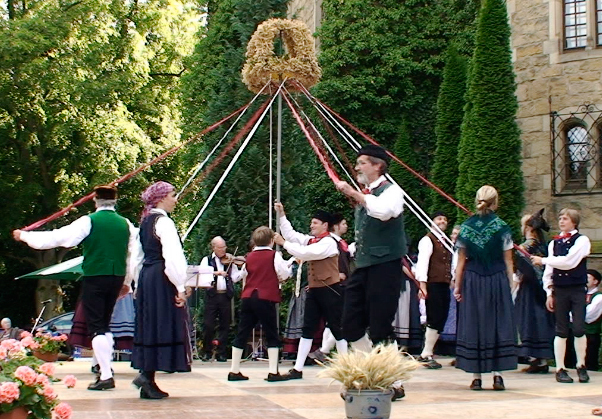 Main activities – Dancing for display a selection of dances collected from all over Germany. 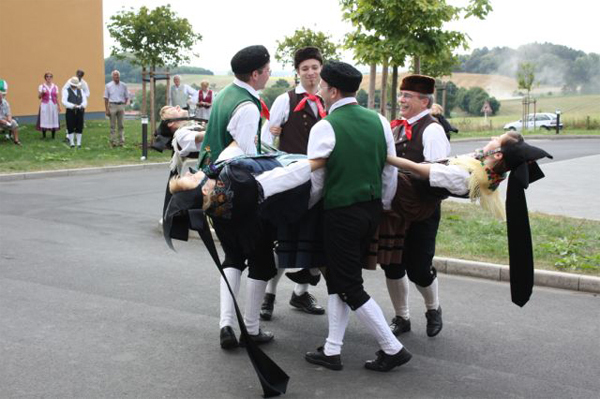 Mainly danced in couples in set formations the dancers tend to reflect the various professions found in the country. They have also a repertoire of some light-hearted moments with dancers playfully fighting for sweethearts, or the intriguingly named Ox Dance depicting two males in conflict. Our costume – is inspired by the national costume originating from the period 1850 -1870. It was worn in almost one hundred villages in the southern area of Kassel. 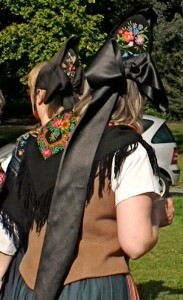 This elaborate form of dress is referred to as Niederhessische Spitzbetzeltracht [Lower Hessen sharp hat costume] with reference to the black pointed hats worn by female members of the group. The dancers created their own hats with ribbon hanging decoratively at the back. The complicated designs have been carefully selected from historical drawings and patterns, their elaboration being indicative of the wearer’s wealth. 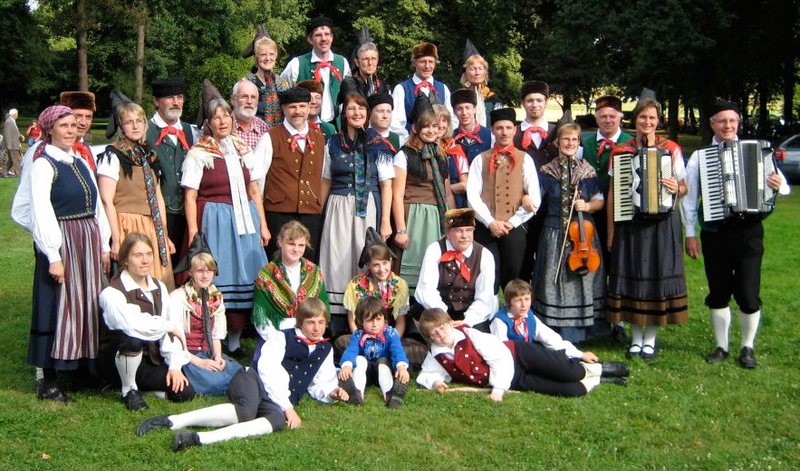 Membership – Presently the group has 95 members, 34 of which belong to the two children’s groups, the Krümel (“Crumbs”, ages six to ten) and the Pfefferkörner (“Pepper corns”, ages 11 and older). About 30 of the adult members are dancing actively on a regular basis. In the past: European folk festival Burg Ludwigstein in 1965 and 1978, Europeade for European folk culture in Antwerp in 1988, Deutsches Trachtenfest in Marburg/Lahn in 1996. 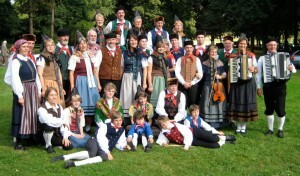 On a regular basis: Hessentag, an annual German festival taking place in alternating Hessian towns, Landeskindertrachtentreffen, an annual meeting of children wearing traditional costumes and dancing traditional dances.